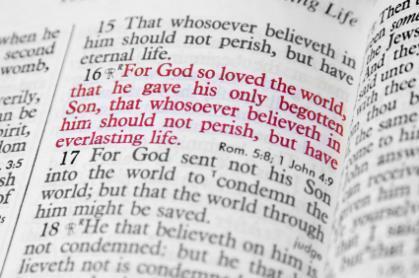 There is, perhaps, no more popular verse in the Bible than John 3:16. Whether you’re watching a professional baseball game or the Olympics on TV, you are bound to see a follower of Jesus holding up a sign pointing people to this blessed verse. The verse is simple, yet powerful. The verse is deep, yet understandable. The verse is condemning, yet contains hope. Certainly, a pastor could preach on the blessed truths of John 3:16 for weeks and not scratch the surface of its message. Naturally, the world stands guilty before God (Romans 3:19). Without Christ, every descendant of Adam will surely be condemned eternally to the Lake of Fire (Revelation 20:15). The latter part of John 3:16speaks to the eternal state of all those that die apart from Jesus Christ. Because they are guilty before a thrice holy God, they will surely perish. Because God is righteous, there is no other possible end to those that have rebelled against His demands. “But where sin abounded, grace abounded much more”(Romans 5:20). The word “world” translated here comes from the Greek word “kosmos”. This word means “mankind”. Certainly, God’s love for mankind is far different from His love for the rest of His creation. It was in the likeness of man that Christ came. It was for men that Christ died. Some have said salvation cannot be by faith only (as Ephesians 2:8 clearly declares) because “the demons believe—and tremble!” (James 2:19). But, Christ didn’t die for demons. It was to mankind that Christ was sent. God’s covenantal love doesn’t extend beyond mankind. God proved His love by sending Christ to die for us. “In this is love, not that we loved God, but that He loved us and sent His Son to be the propitiation for our sins” (1 John 4:10). It’s difficult for a parent to comprehend such a sacrifice. God gave His only begotten Son for sinners? God placed the sins of rebels on His righteous Son on Calvary’s cross? You mean God loved us that much? Yes. This is why John 3:16 says “…God so loved the world”. God’s love for mankind despite our rebellion is shocking, really. But, all the world does not believe. Two verses after our text verse, Jesus declared, “…he who does not believe is condemned already, because he has not believed in the name of the only begotten Son of God”(John 3:18). The unbeliever is yet dead in his trespasses and sins (Ephesians 2:1). The only promise in all of God’s Word to the unbeliever is that of condemnation. However, the believer in Christ is promised eternal life. In fact, John 3:36 says, “He who believes in the Son has everlasting life”. That is, the believer in Christ “has” eternal life…now! Wow, what a merciful and gracious God we do serve. Child of God, take this moment to thank God for His wonderful gift to mankind. There is no other Savior but Jesus. Make sure to thank Him today for the measure of faith that you have. For even that is a gift of God (Ephesians 2:8). Certainly, God’s love for us is unfathomable. But, He proved it nonetheless by giving His Son to die for our sins. Watering the Tulips is brought to you by Sovereign Grace Baptist Church in Northport, AL. For more information please visit www.sovereigngrace.net. “Your App to the Gospel” is available on iTunes, Google Play and the Windows Phone Marketplace. Please download it today!